A wheel of hard, aged cheese. At age 15, Father Michael joined the Vallombrosian monks, and it fell on him to find a way to generate income for the monastery. 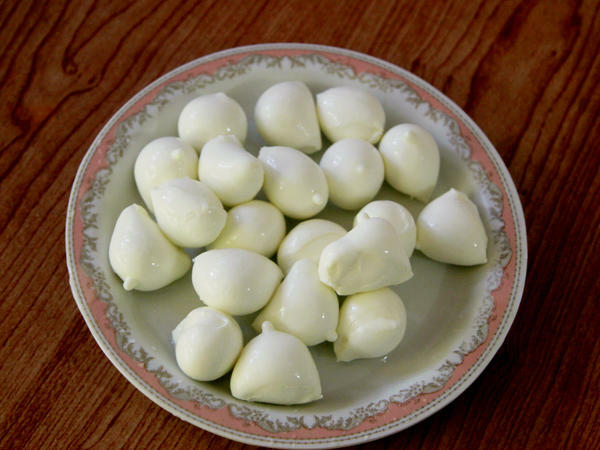 The monastery makes a small range of Italian cheeses, including bocconcini. 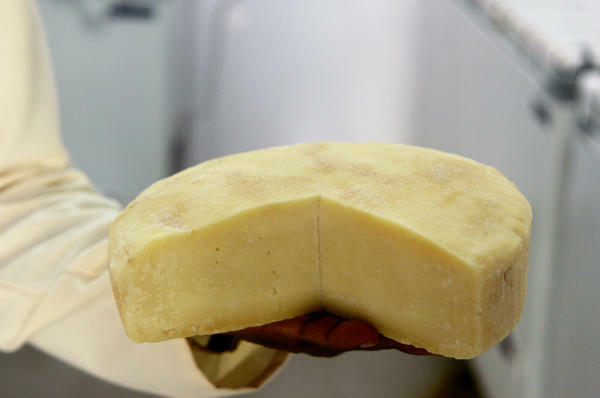 In a monastery tucked away in a quiet back lane of Bangalore, India, Benedictine monks of the Vallombrosian Order are using their European connections to meet rising demand for fresh, Italian-style cheese in this South Asian country. As Western lifestyle and cuisine gain popularity in India, there is a growing legion of cheese lovers. Most cheese, however, is imported and expensive, as well as adding to the cost of international cuisine at local restaurants. For more than a decade now, the Vallombrosians, who originated in Vallombrosa, a picturesque small Italian town not far from Florence, have been meeting this demand by producing a small but steady supply of Italian cheese. "We have to spend time in contemplation, but we also have to work to sustain our activities and community living. Ora et Labora [pray and work], as per Saint Benedict's rule," explains Father Michael, who, at 15, was among the first Indians to join the order in 1988. As an early Vallombrosian monk in India, it fell upon Father Michael to find viable, income-generating work options. "Back in Vallombrosa, the priests make table wines and herbal liqueurs, but we felt it wasn't appropriate for India," says the monk, referring to the country's conservative attitude towards alcohol — particularly when mixed with religion. Monasteries in Europe have been making their own cheese for centuries, and many regional specialties like Roquefort, Muenster and tête de moine (Monk's Head) are traditionally monastic cheeses. And yet, it did not occur to Father Michael to take up cheese-making, because cheese is not part of the mainstream Indian diet. But indigenous cheese variants do exist, particularly in the Himalayan region, where communities produce small varieties of both soft and hard cheeses with the milk and buttermilk of sheep, yak, cow and dzomo (the hybrid of cow and yak). The monks in Bangalore only realized the potential for cheese-making as a business when an Italian businessman with ties in India — the monks refer to him as a friend of the monastery — complained to them that it was impossible to find good mozzarella in India, while pizza and pasta joints were aplenty in the big cities. Father Michael, who spent several years in Italy as a liturgical scholar, speaks fluent Italian. He tapped into his connections to import used machinery from Italy and traveled there to learn more about the art. After the monastery started producing cheese, he began to make cold calls to local restaurants, offering to send them samples, which included a small range of Italian cheeses like mozzarella, bocconcini, ricotta, burrata and mascarpone. That was 13 years ago. Today, Father Michael has a steady bank of upscale restaurants and luxury hotels as clients — not just in Bangalore, but also in Mumbai and Delhi. Presently, the monastery produces about 220 pounds of cheese per day. The cheese is also sold in select outlets in Bangalore, but as Francesca Cossa Valentini, an Italian expat who has lived in the city for several years, says, "It is not easy to find Vallombrosa cheese, but it's pretty good." Valentini laments the lack of variety in some monk-made retail packs: "Italian cheese is not just mozzarella and ricotta." The monks have been fine-tuning their sales and distribution strategy over the years, and they prefer to sell to restaurants, because most Indians who do eat Western cuisine do so at restaurants. Only a small number experiment with cooking international dishes at home. Ema Trinidad is an expat based in Bangalore. Originally from the Philippines, Trinidad has lived and traveled to several countries, including the United States. "I love cheese and I really missed it after moving to India about 10 years ago," she says. "Good cheese was really expensive." Trinidad says she discovered Vallombrosa cheese while dining at one of the restaurants at JW Marriott — which in India is a luxury brand — in Bangalore. "The cheese was so fresh and tasty. I remember specifically asking the chef where I could find such good Italian cheese in India," recounts Trinidad. 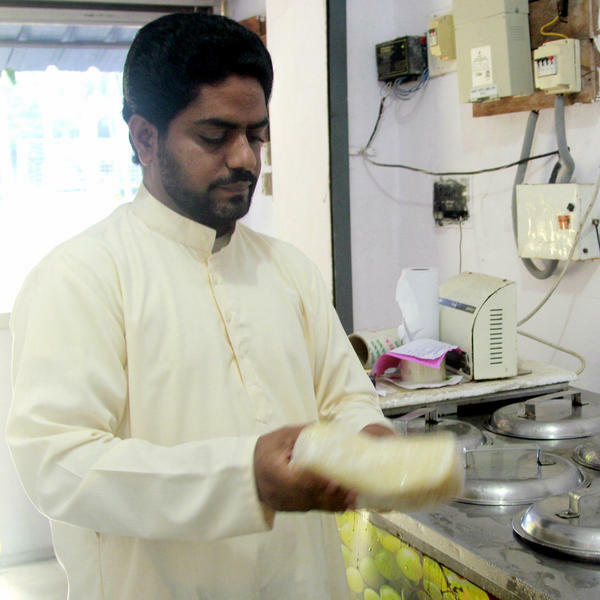 Making fresh cheese in India that tastes authentic is not easy, and Father Michael has had his fair share of hurdles. Initially, the Benedictine tried to make cheese in his hometown of Kottayam, a city in a neighboring state in southern India which remains hot and humid through the year. "It was a complete failure," says the priest who then moved to Bangalore, which has a more moderate, cooler climate. The monks also discovered that milk, the key ingredient for cheese-making, continues to be among the most adulterated food products in India. After trying several suppliers, who delivered milk of varying quality, the monastery bought a herd of buffaloes. But they found that managing them was quite a hassle. "We pay much more than the market price to ensure that our milk is free of adulterants. Even then, there have been times when the cheese simply does not set and we have to discard the product," says Father Michael. Vallombrosa cheese may be the answer to the prayers of many cheese-loving Indians, expats and chefs seeking fresh, local products, but not everyone's a fan. "It was very hard to find good cheese when I started out, and to be honest, even now it is not easy. Hard and long-lasting cheeses are still being imported, but good quality fresh cheese is still a nightmare," says Ritu Dalmia, a celebrity Indian chef who is famous for making Italian food more accessible to Indians through her restaurants, books and cooking shows. "I have only tried Father Michael's burrata. Maybe it had traveled some distance, so unfortunately it was not very good," says Dalmia, who is based in Delhi, some 1,300 miles away from Bangalore. And do the monks themselves ever get to enjoy the cheese they make? Occasionally, when there is some left, the novices are served Italian-style cheese with chapathi or Indian flat bread for breakfast, says Father Michael. Like everything else about this Italian-origin order in India, the answer reflects a confluence of two distinct cultures.